Whale with no tail adapts a new swimming style so it can migrate. 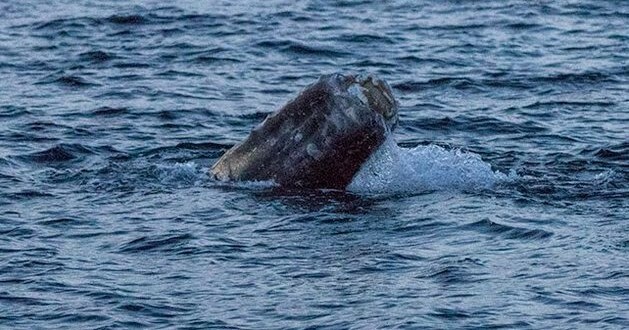 The grey whale was spotted travelling alone on Sunday off Dana Point, but was then seen on Monday off Point Vicente in Los Angeles County joining two other grey whales on the northbound migration. Speaking to The Grind, Captain Tom White of the Dana Pride, which runs from Dana Wharf Whale Watching, said: “It just goes to show how smart these mammals are, to be able to adapt so well without a limb. “It was migrating along fine, although a little slower than what we usually see – about 3 knots instead of 4 or 5. It is believed the young whale lost its fluke (shown as it should be above) relatively recently after becoming entangled in fishing gear, possibly ropes from crab or lobster pots. Entanglement in fishing nets kills nearly 308,000 whales and dolphins a year — that’s a whopping 843 every day. “The nature of chronic entanglement trauma is perhaps the worst form of animal welfare abuse known to man,” Michael J. Moore, Ph.D., a marine biologist with the Woods Hole Oceanographic Institution, told The Dodo. It’s likely that the net slowly cut off the flukes, “giving the major blood vessels that feed the fluke time to clot and heal as the damage got deeper,” he said. This isn’t the first time a whale has been seen without flukes due to entanglement. In the 1990s, one flukeless gray whale was sighted over a span of nine years in the waters off the Baja Peninsula. Another was spotted in 2011, traveling a recorded 100 nautical miles in just nine days without a tail. And in 2012, a flukeless dolphin was spotted off the coast of Australia. The animal had adapted by swimming in a side-to-side motion like a shark to stay afloat.